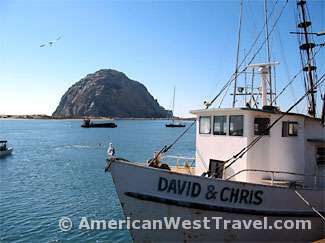 One of my favorite beach towns is Morro Bay, California, about midway between Los Angeles and San Francisco on the famous coast highway, California-1. 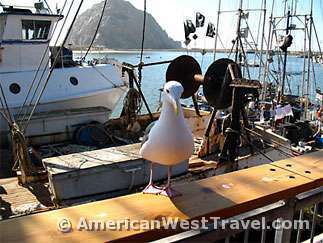 Morro Bay is dominated by Morro Rock, an enormous volcanic plug which rises 578 feet at ocean's edge. A large sand spit (photo, below right) runs for miles north to south creating an almost perfect shelter for the harbor and adjacent tidal estuary. The bay therefore offers excellent opportunities for small watercraft such as canoes, kayaks, and small sailboats. Above: a panorama of the north end of Morro Bay. 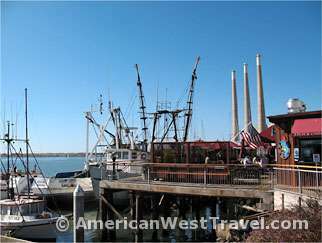 The waterfront offers docks for pleasure craft and the local commercial fishing fleet, as well as a shopping and restaurant area alongside the docks called the Embarcadero. 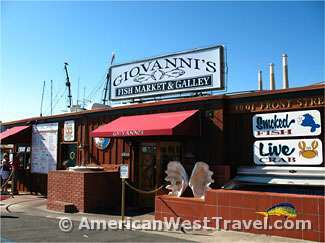 First row, below left: Giovanni's (also seen in panorama above). Below, right: The dockside patio, with the local fishing fleet adjacent. Bottom row: great views from Giovanni's patio. 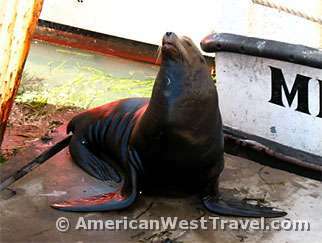 So you get to sit dockside, enjoy your fish lunch and wonderful views, and marvel at all the sea lions. 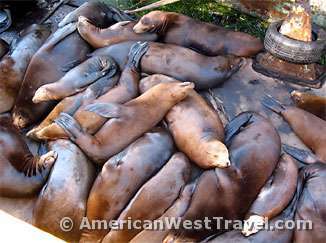 Update, sea lions relocated: The sea lions have been moved off their dockside hangouts and now reside on a barge set up for them about 100 yards out in the bay. You now need to rent a kayak or canoe, or take a harbor tour to see them up close. 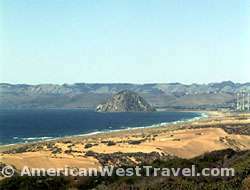 The Morro Bay State Park is just south of town. Here you will find a small marina where canoes are available for rent. The marina's Bayside Café offers fine dinners and great desserts. The Morro Bay Estuary, adjacent to the marina, is a fragile marshland whose channels fill with water during high tide. It is an excellent place to observe wildlife, particularly larges birds such as the white heron. There is a short trail at the south end of the marina which goes along the edge of the estuary offering fine views. The state park offers a large, semi-wooded - and recently remodeled - campground (reservations strongly recommended), a very scenic golf course, and trails on the hillsides. Across the street is the very excellent - also, recently remodeled - Museum of Natural History. The museum has a docent program which offers free daily guided tours and hikes to natural places in the area. A schedule is published on their website. For more information and numerous helpful links, visit our California Central Coast Guide.